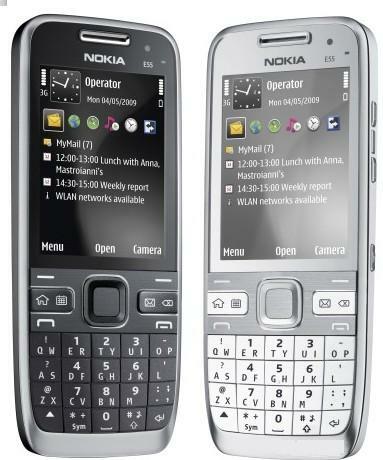 We earlier reported about two recent Nokia Eseries models Nokia E52 and E72 . Among which the E52 is already across Nokia stores world over . Nokia E72 and another new model E55 are expected to hot markets by Q3 of 2009 .Nokia E55 was first announced at mobile world congress in February .Specifications of Nokia E55 is almost similar to E52 . Both doesn’t have slid-out QWERTY keypads, they will have 3.2 mega pixel cameras , ARM 11 600 MHz processor and Symbain OS S60 V3 rel 2 . Nokia E55 adapts almost same design from old Eseries models like E51 .The only difference we found from E52 from E55 is the 2GB included memory and keypad .But the price of Nokia E55 is reportedly 100 $ higher than E52 . Lets see if people are ready to by phones in same configuration with different prices . Both Nokia E52 and E55 offers 3.5 mega pixel camera with fixed focus (no auto focus ??) and front VGA videocall camera. All necessary email and data connectivity features available in all Nokia Eseries phones are also available on E55 . Both have 2.4 inches screen with 240 x 320 pixels and accelerometer sensor . Bluetooth ,3G ,EDGE ,GPRS ,WiFi ,A-GPS and USB . Full web browser with WAP 2.0/xHTML, HTML support . Microsoft Office2007 viewer and editor (Quick Office 2007) ,PDF support . This specification is exactly similar to that of E52 with difference in keypad and installed memory . The official price of Nokia E52 is around 350 $ . But the price of Nokia E55 is specified as around 450 $ in some European stores . We haven’t seen any reason for this crazy pricing from Nokia . But it seems the pricing will fall around 18000K INR when it is officially launched India .